The two most common metals used in the creation of heatsinks as electronic cooling solutions for electronic devices are aluminum and copper. Each metal has benefits and drawbacks and this article will cover these. Aluminum has two big advantages over copper, cost and weight. Copper can be up to three times more expensive than aluminum when cost is a factor in the decision. Another factor to consider is weight, aluminum weighs 1/3 less than copper. Because of this, aluminum is typically a better choice when creating light weight electronics and components. The primary advantage of copper is that it a little more than twice as conductive as aluminum. This is only helpful if the heat sink is working in conjunction with a fast air speed of 800 LFM (Linear Feet per Minute), or if targeting a small area of a CPU or semiconductor in comparison of the size of the chip. In circumstances where the air flow is slower (400 LFM or lower) or the hot spot in the CPU or semiconductor is larger or more distributed, aluminum is a better choice for the heat sink. 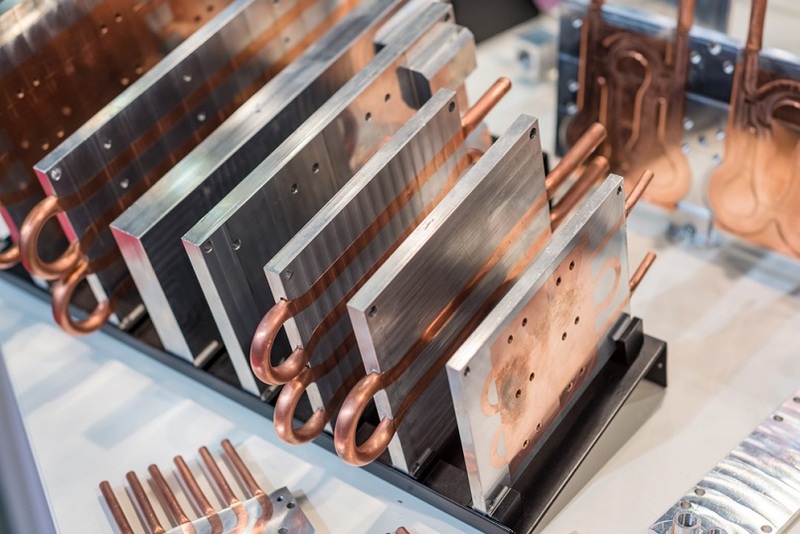 So, when selecting material for heat sink turnkey manufacturing, you need to consider the function of specific components that require electronic cooling solutions. Because aluminum is still very good at conduction, the cost savings and reduced weight may make it a better choice for your electronic thermal management solutions. If you are looking for great options for heat dissipation in electronic devices, look no further than Getec Industries. Not only do we provide custom heat sinks, but we also provide CNC machining for aluminum and extruded aluminum tubing. Get more details about our products and services by completing our online contact form or calling 888-000-8499 today.